Editor’s note: Dr. Ulrich ("Ulli") Stein of Weingut Stein writes each spring a wine letter to his clients, with a vintage report and much, much more. Unfortunately, this year’s wine letter begins with sad news. On the night of November 19, 2014, our father, Heinrich Stein, died at the age of 92. What comforts us, though: He was satisfied and happy even on his last day and gently fell asleep on the following night. Heinrich deeply touched us. He created so much; he has influenced and impressed so many people; he has given so much love and care. All of this remains—and so does he. 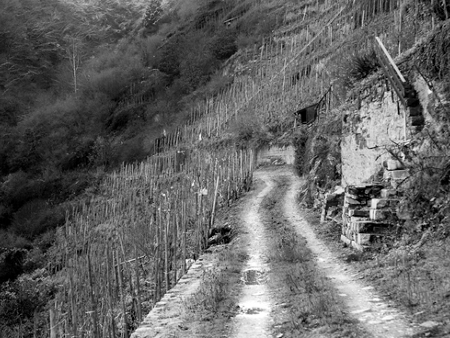 Among the many memories, we have his vineyards with the numerous dry stone walls and his profound knowledge, which he has passed on to us in the last fifty years. Especially in vinifying the 2014 wines, we could use and implement many of his tips particularly well. The past year—which, with an average temperature of 10.3 degrees Celsius (50.5 degrees Fahrenheit), is the warmest year since records began—was even more difficult than the already extreme one before. In the Riesling regions of the Rhine and Mosel, we had another shockingly small harvest. The cause was the extreme weather and vegetation period over the last year. Winter did not take place, and a warm spring led to a rapid budbreak of the vines. May was so-so, June and July very warm, August too cool, September variable once again, and October warm and overall too wet. This led to a sudden onset of botrytis and a rapid increase in rot in the ripening grapes exactly at the start of the harvest. Fortunately, there were some nice days, and we could harvest in this “record autumn,” between October 5 and 19, overall good quality—but only half of an average year once again. The gray mold caused by Botrytis cinerea is difficult to control and is the most dangerous among the fungal diseases, such as peronospora (downy mildew), oidium (powdery mildew), Roter Brenner, and black rot. Botrytis is the only parasite that can infect the vine throughout the year and attack all the green vine parts and also the one-year wood. But the greatest damage caused by the fungus is on the grapes at the beginning of maturity, from about 30 to 40 degrees Oechsle, when they are most vulnerable. In hot and humid weather, the fungus grows through the skin of the unripe, sour berries and leads to so-called sour rot. In the infected berries, the pest can grow in the main shaft of the grape and cause the dreaded stalk rot with a related falling off the grapes. Under favorable conditions, the pest becomes the beneficial organism. At about 80 degrees Oechsle, an infestation of botrytis in dry weather results in raisin-like shriveling from the evaporation of water through the perforated grape skin. As a result, the decisive ingredients, like sugar, glycerin, aroma, and minerals, become concentrated. The quality improvement known now as noble rot is crucial for the production of sweet Auslesen, Beerenauslesen, and Trockenbeerenauslesen. The increased rainfall last autumn intensified not only the infestation of botrytis but also the production of aroma and flavoring agents. With sufficient moisture, the vine roots are better able to absorb the soil nutrients and minerals present in the soil and transport these into the grapes, where they enhance the formation of aroma and flavor. This and low yields resulted in the concentration of grape ingredients and explains the high extract values and the pronounced fruitiness of the fresh wines. In order for these qualities, which arise in the vineyard and are further developed and strengthened in cask or tank, to keep long and even improve after bottling the wine means that the right closure is of paramount importance. We have carried out for this enormously important issue numerous trials in the last decade. Various wines were bottled with natural corks, synthetic (plastic) corks, crown caps, and screwcaps and tested for their effects on freshness and fruitiness over several years. The rare glass closure was not included because of high costs and delivery problems. As a general rule, with the application, evaluation, and acceptance of bottle closures, in addition to the objective technical properties, the “psychology” plays an important role—and often even the decisive one. This is especially true for high-quality, complex red and white wines, in which most customers only accept natural cork as the proper closure, while simpler wines “may” be bottled with alternative closures. With plastic corks is the development even more significant. According to the manufacturer, the latest generation is produced from “renewable, sustainable polymers based on sugar cane” and is carbon neutral, and the oxygen exchange can also be regulated. The “sugar-cane cork” is absolutely neutral to the taste and can protect the wines from oxidation and aging up to eight (!) years in the bottle. With the sealing of wine bottles, natural cork made from the bark of the cork oak (Quercus suber) continues to do amazing things. Even the ancient Egyptians closed their amphorae with cork stoppers over 4,000 years ago. Since the late 18th century, cork closures have been used for wine bottles. Corks are highly compressed in a cork machine and then expand again in the bottleneck, where they provide a seal over a period of 20 to 40 years. It allows gases (carbon dioxide and oxygen) to diffuse in and out of the bottle, while the precious liquid remains in the bottle. Although it is often said that this gas exchange plays no role in the development of the wine, many scientific findings and practical experience tells a different story. Especially high-quality red and white wines, which are often cellared longer, can “breathe” and develop harmoniously during bottle aging under cork. If only the damned corked wine didn’t exist! Natural cork can give off different chemical substances (trichloroanisole, phenols) on the wine and these can taint the wine with musty and bitter notes. The information on the proportion of corked wines vary worldwide between 5 and 15 percent, which corresponds to approximately one billion (!) bottles with cork taint. By using carefully produced—and correspondingly more expensive–corks from a renowned Portuguese producer is the proportion of corked bottles in our winery at about 1 to 2 percent. We use corks for our high-quality wines. Of course, we will replace a corked bottle for you. While the previously mentioned psychological and technical reasons speak in favor of natural cork for complex wines, it looks much different for simple and better everyday wines. On the one hand, the acceptance of alternative closures is greater than before. On the other hand, the increased gas tightness keeps longer for the desired characteristics such as freshness and fruitiness. And all this without having corked wines! Considering all these factors, we use the following closures for our wines at this time: the sparkling Riesling and Rosé-Seccos with 2.5 bar pressure in the bottle must be specially sealed, so we use for these sparkling wines the absolute impermeable crown caps made of stainless steel. Our slightly fruity liter wine is bottled with an uncomplicated, practical screwcap. Also because of the “pop” effect, the mid-range wines, like Blauschiefer, rosé, and Neefer Frauenberg, have a high-quality plastic cork, namely the sugar-cane cork. We use the classic natural corks for the high-end wines, including Sekt. Its treatment and processing will also be continuously improved. For the “transition candidates,” like Kabinett, the two-star wines, and Cuvée X, we still prefer to use natural cork. Its future depends on the quality. We think that we have compiled with the various closures different “demands,” both for the wines and our pleasure-loving clients who want to enjoy tasting the fine fruity, racy 2014s. We raise our glasses to our patron saint and to you, his loyal wine lovers. Photograph by Tobias Hannemann, St. Aldegunder Palmberg-Terrassen.